Bihar School Examination Board for Inter Matric Exam 2018 going to make registration online from 05th July 2018. Students who are going to appear in the Annual Exam in 2019 have to make registration online from respective school college. Students can download Bihar Board 2019 exam Registration Form for appearing in the exam streamwise. BSEB Matric Registration 2019 Form to download available online. Students may be searching for the Bihar Board inter registration date/fee and Bihar Board matric exam registration 2018 form fill online start date and last date and fee detail. After the download of BSEB Matric/Inter Registration Form and fill the detail like personal details, other detail which they ask. Matric detail for intermediate and cast category with communication date and have to select the subject in which they want to make the registration. Important: every student is suggested to fill their Registration form carefully and provide the details correctly to avoid any mistake fill the form after concerning to the school administration. While filling of form takes care of special attention of writing down applicant name, father’s name and mother’s. Fill detail of intermediate registration on basis of matriculation certificate. Note: Online registration can proceed online only by the school/college principal login, which has already provided by the Bihar School Examination Board, Patna. The student unable to fill BSEB Online Registration Form for 2019 Annual Examination. 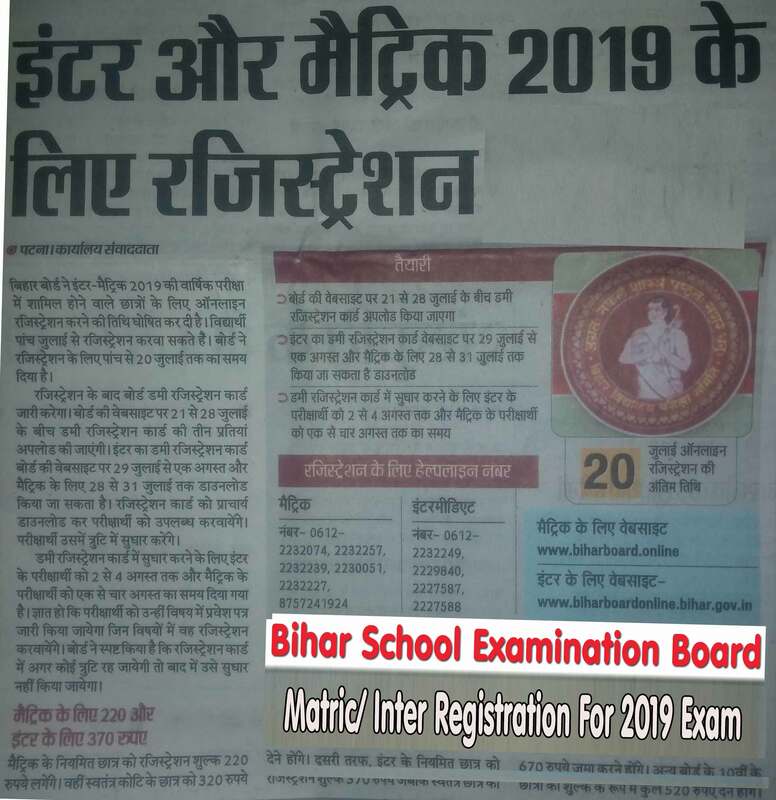 On this web page, we will provide the completed information about the Bihar Board 2019 Registration for Examination of matriculation and intermediate. For making registration online of Bihar Board Intermediate have to pay an application fee, application fee can be paid online using net banking, Debit Card or Credit Card or using the e-challan by direct deposit of Cash. School / College administration can fill an online form and paid BSEB XIIth Registration Fee. The fee is as given below. Students of matriculation can also have to pay the registration fee for Matriculation Registration 2018. Regular and private students have the category wise registration fee which has been given below. Students are suggested to explore more information about intermediate or Bihar board Registration from their respective school. Students visitors can ask their query regarding Bihar Board 2019 Exam Inter Registration or BSEB Matric/10th Exam 2019 Registration-related queries. In the portal of online registration for intermediate 2017-2019, user ID will be school roll code but what is the password how I can get the password, because at the portal there is mentioned password provided by B.S.E.B, but I din’t get any password please advise? Hello sir, I am an intermediate student.I am going to appear in 2019 board exam. Now I have to register myself for the exam, but my college’s teacher demands 1900 for registration. How it is possible? Because in your article mentioned fee is only 370.why this gambling sir? Sir mene 11th ko science stream se study Kiya hai but an Mai 12th ko arts stream se study karna chahta hu kyunki me science me acchha perform nhi Kar pa rha hu. Mujhe wishwas hai ki me arts ko behtar tarike se Pura kr sakta hu. Kya abhi stream change karna possible hai? Sir mene 11th ko science stream se study Kiya hai but an Mai 12th ko arts stream se study karna chahta hu kyunki me science me acchha perform nhi Kar pa rha hu. Mujhe wishwas hai ki me arts ko behtar tarike se Pura kr sakta hu. Kya abhi stream change karna possible hai? Iska kitna lagega? If Board will again open the link for the registration then we will update you about it. jaise hi iska koi update aayega hum suchit karenge! Registration for appear in 2019 exam is going on please contact your respective school. It will last by 10th Sept 2018. Inter ka registration charges regular student ko 370, aur privet student को 670, hai bihar government ki taraf se lagu kiya gya hai. Fir bhi jamini hakikat ye hai ki school aur college ke andar manmani rakam vasuli jati hai, q sir. Khi 1100,1300,1400,1500,esme bhi jati ka kota dal diya gya hai. (Kisan mazdur high school) ye school ko abhi do shal pahle इंटरमीडिएट kiya gya hai. Aur yha manmani tarike se paisa vsula jata hai. Puchhne par sabhi master kahte hai ki, सरस्वती पूजा. 26 जनवरी, 15 अगस्त, 2 अक्टूबर etc. Ke nam pe jod kar paisa liya jata hai. Ye to sarasar anyay ho rha hai students ke sath. Ab aap hi batao hum students kya kare. Sir mera registration kisi karna se nhi ho paya h please Sir ak last chance chaiya please. Agar mera registration nhi ho ga too mera ak saal khrab ho jay ga. Isliya please Sir ak last chance mil sakta .